PORTLAND, Ore., Feb. 5, 2018 /PRNewswire/ -- The Portland Timbers today announced that the club has entered into a multiyear partnership extension with Alaska Airlines. As part of the continued partnership, the iconic Northwest airline's wordmark will continue to be featured prominently on Timbers game kits and club apparel. In addition to being featured on Timbers jerseys, Alaska Airlines will continue to serve as the team's official airline. 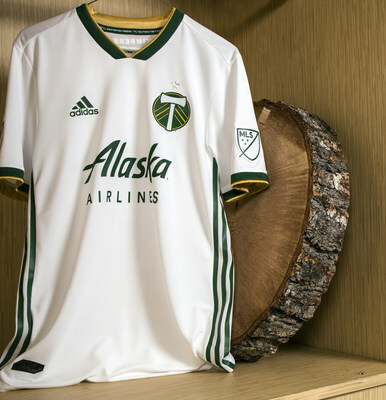 Alaska Airlines, a Founding Partner of the Timbers, has been the club's jersey partner since its inaugural 2011 MLS season. "Alaska Airlines and its amazing group of employees have been part of the MLS Timbers family from the very beginning," said Mike Golub, president of business for the Timbers. "We couldn't be more happy and proud that our wonderful partnership will continue well into the future." "The city of Portland has a deep soccer heritage that promotes a strong community spirit. Our long-standing partnership with the Timbers is a testament to our commitment to the Portland community and the loyal Timbers fans," said Andrew Harrison, chief commercial officer at Alaska Airlines. "As a company it is important for us to invest in and make a difference in the communities where we live and work."